When high winds and tides agitate debris, decaying organic matter, salts, and other flotsam and jetsam floating among the surface of the ocean pockets of air form and rise to the surface of the water. With enough agitation these pockets of air band together and form a thick yet buoyant foam that can pile several meters high along the shore (“What is Sea Foam?,” 2013). The colors of this foam are usually a pale beige or white if spawned from organic materials, but foams can be tinted a brown or red color if formed from waters containing human pollutants such as spilled oil and factory runoff (“What is Sea Foam?,” 2013). This foam is often a nuisance to beach goers as it can make navigating the shore difficult, and, depending on the nature of the organic matter that lead to its formation, emit a foul odor. With its foul smell and composition frequently consisting of decaying sea life, the foam is not something inherently beautiful. I witnessed an occurrence of the foam during a trip to the Oregon Coast among high wind warnings and frequent downpours. Despite the smell and the blustery wind, the sight of the foam swirling and lifting high into the air above my head was mesmerizing. The foam appeared lofty while in flight, but its movement in the waves had visual weight to it, and had soft undulating bumps along the surface. It was a unique natural texture that I had never seen before. My design scholarship is rooted in the translation of natural movement, texture and phenomena into original surface and textile design. My previous work has been influenced by the flow and texture of lava, the concentric design of tree rings, the color work and movement of butterfly wings, and patterns of feathers on birds. After living in Oregon for four years and witnessing the natural beauty of the Oregon coast from the cliffs of the Coastal Range to the miles of beaches covered in driftwood and oyster shells, my current scholarship is aimed at developing new surface design techniques to represent the natural occurring phenomena along the Oregon Coast. Dancing Seafoam is the first in a series of garments that will be completed dedicated to the natural elements found along the coastline. The design process of the garment started with exploring previous designer’s endeavors into representing coastal phenomena and embellishment techniques. The most compelling garment of this nature is Alexander McQueen’s “Oyster Dress”, a garment from his Irere collection meant to evoke a shipwrecked maiden stepping out of the sea (Bolton, Sundsbø, Blanks, & Frankel, 2011). The dress is embellished with hundreds of rows of silk flounces, with long flowing strands handing from the shoulders. For me, the “Oyster Dress” was used as a stepping off point in the direction of creating a garment that had compelling movement, a gritty and natural appearance, and when worn seemed to swallow up the wearer. I wanted to design a dress that was overwhelming, yet had a lofty appearance and moved like the foam I witnessed that day. I began the construction process by testing various ways to achieve the look of floating and bouncing pieces of seafoam. Initial design concepts involved the installation of interior fans into the garment that when turned on would surround the wearer with pieces of the artificial foam. This proved to be a more complicated engineering feat that my skills and budget could reproduce, and so the design morphed into something that was self-contained and would float when the wearer walked or was exposed to a breeze. I tried several methods of recreating the bumpy foam texture of the garment, including using starched fabric formed over molds, layers of tulle, and finally settled on hand tucked puffs formed over a layer of loose stuffing. The base of the garment was created using draping and flat patterning techniques and is constructed out of 72” wide felt. Felt was chosen for its stable hand and wide width. The felt provided an anchor for the hand sewn puffs that would not crumple under the weight of the dress. 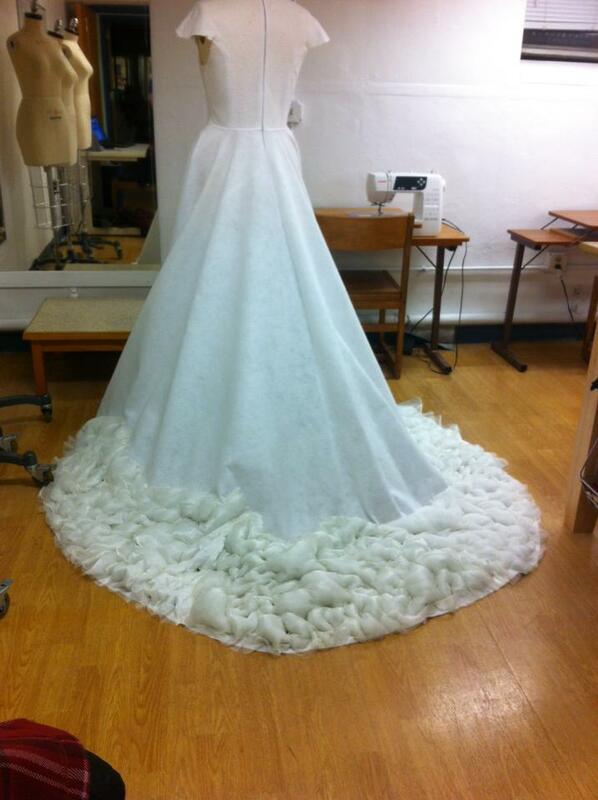 The overlayer of the garment is made of ivory polyester organza handsewn into various sized puffs. The inside of each anchored puff is beaded with sequins, wooden beads, or shells to represent the mixture of sand, debris, and organic material mixed into the foam when it washes up on shore. The puffs start larger in size and gradually become smaller and closer together towards the top of the dress to balance off the large size of the garment. The garment also features loose hanging puffs of organza attached with clear fishing line throughout the dress. These loose pieces sway and float around the dress when it is in movement or in a windy environment. These hanging pieces mimic the swirling and floating movement of the foam I witnessed on the Oregon Coast that day. This garment won the 1st Place award for Innovative Design sponsored by Fashion Supplies Inc. at the International Textiles and Apparel Association in Vancouver, BC in November of 2016. Bolton, A., Sundsbø, S., Blanks, T., & Frankel, S. (2011). Alexander McQueen: Savage Beauty (First Edition, Later Printing edition). New York : New Haven, Conn: Metropolitan Museum of Art.